Let me start off by saying this: I’m what you’d call a “lazy and cheap backpacker.” In other words, I did not trek the Inca Trail. Why? Because that seems like a lot of work when I can just take a train there. I bet the Incas would have taken the train if they’d had a train. I took the one that left from Javier del Prado in Miraflores (a neighborhood of Lima). This bus ride takes 22 hours, but it’s not as bad as it sounds. The seats are roomy and comfortable (and recline a full 180 degrees! ), so you should be able to get a good night’s sleep. The meals are few and unappealing, so I would recommend packing some snacks or a couple sandwiches for the trip. I’d also recommend choosing a seat on the back right of the bottom level. It’s less bouncing around, you won’t have to worry about anyone behind or beside you and you get a little extra room. The bus will take you to the Cruz del Sur station in Cusco. I recommend this because Ollantaytambo sits at around 9,000ft while Cusco sits at a brain-popping 11,500ft. It’s better to reach high elevation and then sleep at lower elevation. This will also allow you acclimate easier and come back to Cusco with less of a problem. Grab a taxi from the bus station to the central plaza or a local collectivo (van) meeting place. Tell the taxi driver you want a collectivo to Ollantaytambo and he’ll know what you’re talking about. This will cost about s./6-10 ($2-3 USD). If you have the extra cash you can just take a taxi all the way to Ollantaytambo for about $40 USD. 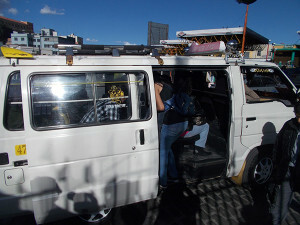 A collectivo is just a van with a bunch of other travelers. This is the cheapest route for a reason. You’ll probably wait 10-15 minutes for the workers to pile as many people and bags into the van as possible before leaving. (I ended up with someone’s kids on my lap, smashed against the window.) They are nice vans though, and the ride is smooth as far as Peruvian transportation goes. Your collectivo price will depend on your negotiating skills. My first one cost 20 soles ($6.33) but my second one only cost me 8 soles ($2.33). Haggle if you have limited budget! If you have the cash, pay the few extra bucks and help support the local economy. I recommend Mama Simona Hostel on the outskirts of town. You can get a motorcycle taxi there for about 66 cents! You can wait a couple days to go to Machu Picchu if you want to acclimate first, or you can head there the next morning! That part is entirely up to personal preference. This is where I screwed up. Don’t get accommodation in Aguas Calientes unless you want to spend double what you would in Ollantaytambo. Instead, take a day pack and a lunch. They will serve a snack on the train, but it isn’t much. This should cover Wanu Picchu as well if you’re wanting to check it out. You can also buy these in advance from a tour provider or via the Peru Tourism Board’s website, but if you’re visiting in the off-season I’d recommend buying from the Tourism Office. It’s cheaper, super easy to find, and less of a hassle/worry. Just ask a local and they will direct you to the plaza, which is right around the corner from the bus station basically. I took a bus (remember my laziness disclaimer at the beginning of this article?) but you can hike up the mountain if you’re a sucker. It’s a 2-3 hour hike and it’s just about as vertical as you can get without climbing equipment. No thank you is what I thought. Haha! I saved my energy for wandering around the ruins. Keep in mind: there is about 30% less oxygen at that elevation, so it’s easy to get winded. Take it easy! Check out the ruins and enjoy yourself! Bring a rain shell, as it can rain multiple times per day there. It’s usually only for a few minutes though, and even when the clouds are abundant the sun still seems to make it to the Cloud City. Supposedly the best time to visit is when the sun is coming up, so if you want to do that you’ll have to drop the extra cash and stay in Aguas Calientes the night prior to your visit. And then relax at your hostel, enjoy the local ruins in Ollantaytambo or grab some food! Total Cost: About $300-350 from Lima to Machu Picchu (and Back), not including food. That’s it, the best combination of the cheapest and quickest way to make it to Machu Picchu. My advice? If you have extra time, relax a day or two in Ollantaytambo before continuing to Machu Picchu, and then take a few more days there before returning to Cusco or Lima. I made the mistake of booking everything concurrently and it really wiped me out. If you have any questions, leave them in the comments below and I’ll reply as quickly as I can! Hey Tom, great post and thanks for recommending bus travel! Ah, but Tom, you missed out on so much skipping the trek. I did the Salkantay trek for aout $230. It’s four days of adventure and glorious hiking through the mountains and down to the jungle. And on the fifth day you go to Machu Picchu. The great thing is that the $230 included all transport and the Machu Picchu entry ticket. It also included a tent and four days of meals. All in all an absolute bargain for backpackers looking to keep costs down. I recommend talking to agencies in Cusco. There’s lots of them and there’s plenty of opportunity to barter down to a great price. Shortcuts, yay! Knowledge of the shortest ways to certain places is a travel must-have, Tom.